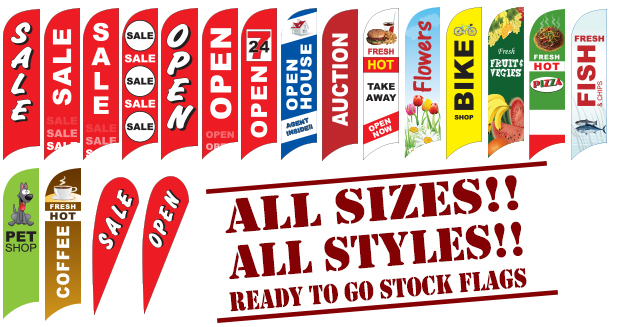 (Also known as Flag Stands, Teardrop Banners, Feather Banners, Bali Banner Flags, Tension Banners Flags). The flag stand system is portable and offers a high impact solution. The entire system can be packed into one small carry bag for convenient transportation so it can be easily carried in the boot of a car or as luggage on a plane. The flag stand can be easily set up by one person within minutes. The flag stand is a great tool to create high impact for marketing and advertising requirements. Ideal display solution for shop front, outdoor events, car and boat dealerships, trade shows, road shows, small to medium events when you can create high impact display with relatively compact solution. 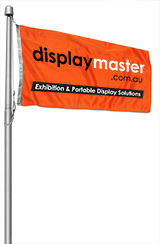 Display Master Australia offers different shapes of flags and different types of bases to suit any requirement. Flying Banners are great for indoor and outdoor use. The Teardrop Flag is attached to a fibre glass pole and available with wide range of mounting options to suite any requirement. Varity of floor stands, wall mounting options, a range of ground spike to suite any type of soil and even wheel mount to be used in car dealership. The pole made of composite material, which is flexible, high resistance to electricity, durable and long lasting. It is extremely light, quick to assemble and comes with its own soft carry bag. Available in Small (2.2 metre), Medium (3.5 metre) and Large (4.5 metre) height options and in Single or Double-sided banner options. The Feather Flag is attached to a fibre glass pole and available with wide range of mounting options to suite any requirement. Varity of floor stands, wall mounting options, a range of ground spike to suite any type of soil and even wheel mount to be used in car dealership. Available in Small (2.4 metre), Medium (3.45 metre) and Large (4.7 metre) height options and in Single or Double-sided banner options. The Tension Flag is attached to a fibre glass pole and available with wide range of mounting options to suite any requirement. Varity of floor stands, wall mounting options, a range of ground spike to suite any type of soil and even wheel mount to be used in car dealership. Available in Small (2.1 metre), Medium (3.0 metre) and Large (4.2 metre) height options and in Single or Double-sided banner options. The Finn Flag is attached to a fibre glass pole and available with wide range of mounting options to suite any requirement. Varity of floor stands, wall mounting options, a range of ground spike to suite any type of soil and even wheel mount to be used in car dealership. Available in Small (2.1 metre), Medium (3.2 metre) and Large (4.4 metre) height options and in Single or Double-sided banner options. The Diamond Flag is attached to a fibre glass pole and available with wide range of mounting options to suite any requirement. Varity of floor stands, wall mounting options, a range of ground spike to suite any type of soil and even wheel mount to be used in car dealership. Available in Small (2.5 metre), Medium (3.4 metre) and Large (4.7 metre) height options and in Single or Double-sided banner options. The Sail Flag is attached to a fibre glass pole and available with wide range of mounting options to suite any requirement. Varity of floor stands, wall mounting options, a range of ground spike to suite any type of soil and even wheel mount to be used in car dealership. Available in Large size only (5.0 metre) height options and in Single or Double-sided banner options. The Tower Flag is attached to a fibre glass pole and available with wide range of mounting options to suite any requirement. Varity of floor stands, wall mounting options, a range of ground spike to suite any type of soil and even wheel mount to be used in car dealership. Available in Small (1.85 metre), Medium (2.85 metre) and Large (4.25 metre) height options and in Single or Double-sided banner options. The Leaf Flag is attached to a fibre glass pole and available with a wide range of mounting options to suit any requirement. Variety of floor stands, wall mounting options, a range of ground spikes to suite any type of soil and even wheel mounts to be used in car dealerships. The pole is made of composite material, which is flexible, durable, has high resistance to electricity and long lasting. It is extremely light, quick to assemble and comes with its own soft carry bag. Available in one size - 3.1 Metre in Single or Double-sided banner options. The Cup Flag is attached to a fibre glass pole and available with a wide range of mounting options to suit any requirement. Variety of floor stands, wall mounting options, a range of ground spikes to suite any type of soil and even wheel mounts to be used in car dealerships. The pole is made of composite material, which is flexible, durable, high resistance to electricity and long lasting. It is extremely light, quick to assemble and comes with its own soft carry bag. The Giant Flag Pole is great for indoor and outdoor use. The base is made of light weight and durable plastic. The poles are made from anodized aluminium lelescopic piping with anti-corosion silver coating. The base can be filled with sand or water to provide additional stability for strong winds and includes mechanism for soft and easy rotation. The banner is quick to assemble and comes with its own soft carry bag. Available in 5 metre option. High quality custom design flags. Create your custom flag from scratch, using our easy to use templates to customize your message. The flags are made from light weight polyester material and have sewn hems all around the flag. The Pole edge has a polyester tape sewn to the flag. Two brass coloured eyelets are punched into the pole edge to allow various fixing options. High quality Australian flags made from light weight polyester material and have sewn hems all around the flag. The Pole edge has a polyester tape sewn to the flag. Two brass coloured eyelets are punched into the pole edge to allow various fixing options. Bunting is a loosely woven coloured fabric, used for flags and festive decorations. A form of bunting which is becoming more and more popular is custom bunting. Creating your own design or corporate logo printed onto bunting flags mean that bunting can be used at almost any occasion for decoration, marketing complain, advertising or just drawing attention to your business. Bunting is particularly useful at large outdoor events to add a splash of colour they are perfect for rounding off a display. The Point-sign flag system is suitable for mounting point of sale flags to vertical or horizontal surfaces. Mounted with screws or double-sided sticky tape, the flag can be perfectly positioned outside any shopfront with ease. At Display Master Australia We have developed a wide range of flag shapes and sizes to suit any requirement: Teardrop flags, Feather flags, Finn flags, Diamond flags, Sail flags, Tension flags, Tower flags and the new style Leaf and Cup flags. Most flag styles are available in 3 different sizes: 2.2 meter 3.5 meter and 4.8 Metres. We carry a wide range of stands (bases). Each stand is suitable for different requirements. Cross Base, Standard Spike, Screw Ground Spike, Vertical Spindle, 25 Degrees Spindle, 90 Degrees Spindle, Fixed Cross Base, Tyre Base and Water Bags. All flags and bases are modular so you can use any flag stands with any flag shape. Display Master Australia offers durable, bright and rich in color flag prints. The flags prints can be done double sided print or single sided print. Single sided flag - we print on one side of the material and the image show-through the flag so the image is clearly visible on both sides. Double-sided flag  we print the image on two separate flags materials (front and back of flag). We then sew the two parts back to back and place additional blockout reinforced material in between for extra durability and strength. Some manufacturers use the same flag material to create the sleeve for the flag pole. This material is not thick enough for the purpose of supporting the flag on the pole resulting in tearing and wearing of the flags. Display master apply special weather resistance canvas sleeve to the flag. This material combats strong wind and rough outdoor weather condition. There are many different manufacturers of this type of flag stands. One of the key factors for the flags to sustain the outdoor condition is the materials used for the pole, and the quality of the joinery mechanisms of the pole sections. 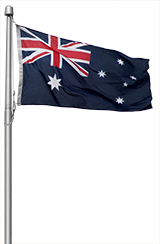 At Display master Australia we use the best materials available providing the flag stand with extreme strength and flexibility to sustain the some of the most extreme Australian outdoor condition, providing you with longer life for your flag Stand. The pole is made of premium quality fibreglass providing superb strength and extreme flexibility to sustain some of the extreme Australian outdoor conditions. The flag stand come with fully digital print that is washable. You can hand wash it or use washing machine on gentle wash. The print can be easily replaced to suit your requirements. The Flag pole is made of premium quality fiberglass providing superb strength and extreme flexibility to sustain some of the extreme Australian outdoor conditions. The flag stands are light and easy to move around. The pole consist of 3-4 sections ( depend of the flag size) the sections are jointed together in a unique reinforced mechanism to allow smooth and easy assembly process. Each flag has its own carry bag making it ideal solution what portability is crucial. When shipped a typical flag stand is packed in a carry bag together with the pole, stand and the flag in a carry bag that is about 120cm long and it weigh about 4-6 kg. Flag stands are quick and easy to set up, Just join the pole sections together and feed the pole in the flag sleeve and it is ready to go. Making it ideal solution when quick setup is required. At Display Master Australia We offers everything from as simple as flag stand for your trade show or presentation needs to a complete trade show and exhibition stand fit. Display Master Australia is the number one choice to buy trade show displays, exhibition stands, expo booth displays and trade fair booths equipments. We also have in house graphic and design team to help you archive the high impact, eye catching, professional look desired for your display Stand . Our product line includes extensive range of trade show display exhibit displays, Banner stands, Pop Up display systems, Concept kit  modular system, Wall displays, folding panel displays, exhibition panels, outdoor displays, flags and flying banners, brochure stands, A frames, poster holders and snap frames, lightboxes, hanging banners, vinyl banners, point of sale displays and much more.